An email came to me, warning me that baby carrots are dipped in chlorine. They are made from deformed carrots, peeled and then dipped in a high solution of chlorine to keep them from turning white and being deemed, “bad”. This made me scratch my head. Food dipped in chlorine that I am feeding my children, who love baby carrots. Thus the research began. Could this be true? I hate to say it but, yes. When a baby carrot turns white they call this, “white blushing” and often times this “white blushing” causes the bags of carrots to pulled from the shelf and thrown away. Consumer waste. To prevent this consumer waste the carrots are then dipped in the chlorine. 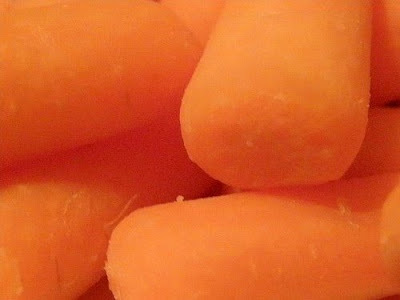 To date, white blush has been controlled primarily by washing freshly processed carrots with chilled water, usually in a hydro cooler, followed by refrigeration and/or by packaging of the freshly processed carrots in specialized containers, including some that maintain modified atmospheres within the containers. Chlorine has also been added to the chilled water treatments for sanitation purposes, and primarily to control microbial bacteria growth on the processed carrots. However, depending upon the above variables, the onset of white blush may only be delayed for a few days. Therefore baby carrots tend to have a shorter shelf life. You can also go find the patented information on washing carrots and the dilution rate of the chlorine the carrots are dipped in, as though that matters. I like baby carrots and find them convenient and my children like them. After reading this and finding out the truth, I will be buying my carrots organic and whole. So much for convenient and packaging, a lessen I should know by now. I suppose if I were to choose the baby carrots I would be washing them very well in my favorite veggie wash. From what I read, some say that it doesn’t matter that a carrot was dipped in bleach but I guess you decide.